OPETH - SORCERESS LTD. BOX (2CD+5.1 AUDIO-DVD+2LP+POSTER+ BOX) | Online Shop | Wizard LTD. Album: "SORCERESS LTD. 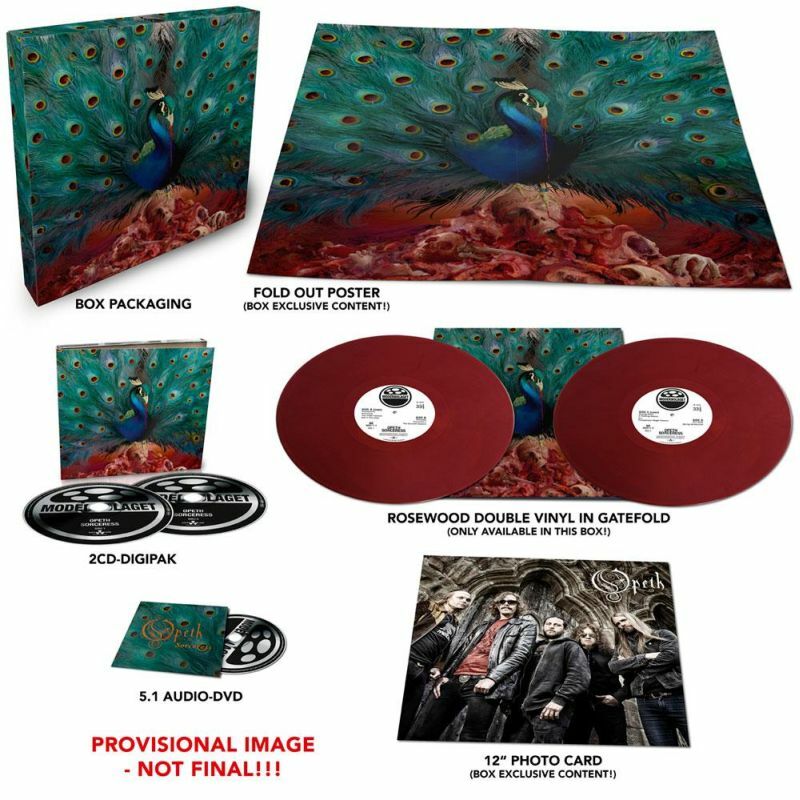 BOX (2CD+5.1 AUDIO-DVD+2LP+POSTER+ BOX)"
OPETH’s new album, »Sorceress«, their first for Nuclear Blast via the band’s imprint label Moderbolaget Records, is proof chief architect Mikael Akerfeldt has a near-endless well of greatness inside. From the album’s opener ‘Persephone’ to ‘The Wilde Flowers’ and ‘Strange Brew’ to the album’s counterpart title tracks ‘Sorceress’ and ‘Sorceress 2’, OPETH’s twelfth full-length is an unparalleled adventure, where visions cleverly and secretly change, colours mute as if weathered by time, and sounds challenge profoundly. »Sorceress« is, by definition, moored in Akerfeldt’s impressive record collection—his one true vice—but, as always, there’s more invention than appropriation at play. Certainly, every OPETH record has had diversity. In 1995, »Orchid« reset the rules of death metal. Six years later, »Blackwater Park« hit the high note for musicality in a genre generally devoid of it. »Damnation«, in 2003, was the work of a band determined to upend the norm. Five years after that, »Watershed« closed OPETH’s chapter on death metal by visiting its darkest corners and holding its native brutality aloft. And in 2014, »Pale Communion« officially bridged the progressive music gap by twisting the intrepid sounds of ‘60s, ‘70s, and ‘80s into contemporary brilliance. So, really, what’s so different about »Sorceress«? Actually, that’s not entirely true. Akerfeldt’s always mining for progressive gold. Good, rare music is particularly good at getting his motor running. He found double-gold in one-off Italian outfit IL PAESE DEI BALOCCHI and BOBAK, JONS, MALONE’s ultra-obscure »Motherlight« album. To wit, get Akerfeldt talking about either and he’s all too pleased to discuss the finer points of IL PAESE DEI BALOCCHI’s string-based darkness or how he fan-boyed MALONE via email to get the famed British orchestrator and one-time IRON MAIDEN producer to contribute to »Sorceress«.